Apichatpong Weerasethakul's Uncle Boonmee Who Can Recall His Past Lives has gotten its first English-friendly DVD release in South Korea. It's out of stock now, but check back later. The UK release is set for March 28, 2011. There's a page on Amazon.com too, for the U.S. DVD due out sometime next year. But don't wait for it to come out on DVD. Uncle Boonmee is one of those films that should be experienced in the cinema, in the dark, immersive environment, on the big screen. As Apichatpong himself would say, "film is magic". I had made a point of seeing Uncle Boonmee theatrically while I had the opportunity. I would recommend the same to others. There are too many shots in the film that need to be seen on the big screen, the bigger, the better, to be understood. One of the first shots is of a water buffalo, barely visible in the distance. A later shot in this first sequence of the loose water buffalo is of the animal barely visible, walking through the foliage. Throughout the film, Apichatpong uses extreme long shots so that the characters are in a sense, lost within nature. The themes of man, nature and animism are continuations explored in Tropical Malady, although it is more explicit in this film. Trouble is, despite the countless film-festival appearances and limited theatrical runs around the world, Uncle Boonmee remains relatively difficult for the average movie-goer to find. In a world where Harry Potter and the Deathly Hallows remains supreme, Uncle Boonmee is but a glimmer in the eyes of the multiplex crowds. The Guardian Film Blog had a look at Boonmee's box-office performance in its U.K. release, in which it debuted in 14 cinemas earning £27,500. "It's not an exciting number. On the other hand, given the challenging nature of the film, it's not bad at all." That tiny number of screens had the BBC's Mark Kermode wondering whether anybody besides critics would be able to see Uncle Boonmee, or would they just wait for the DVD? Metro called Boonmee "as magical as Harry Potter. Similarly The Independent's Jonathan Romney said "if you're looking for real magic in the cinema this week, you won't find it in the industrial gimcrackery of the new Harry Potter episode, but here, in the dense, bewitching foliage of Apichatpong's imagination." The Telegraph's Tim Robey liked it, I think saying Apichatpong's "films creep up on you, like the first time a ghost appears in his languorously bizarre Palme d'Or winner." The Guardian's Peter Bradshaw says "The poetry is all in this calm and gentle equivalence. The film's sublimely spiritual quality induces a benign narcosis." The List asks the question – is it any good? And then has duelling critics argue about. And then there's The Daily Mail, which didn't get it at all. More thoughts are at The Scotsman, Dog and Wolf and Sound on Sight. Unsurprisingly, Uncle Boonmee Who Can Recall His Past Lives is already being tipped as one of the best films of the year, coming in at No. 2 behind The Social Network on the Sight & Sound list. Interviews? Want interviews with Joei? Well, there's one in The Guardian, in which he says the answer to everything is: "You don't have to understand everything." So, we are going to die right, you and I? One day we are all going to turn to dust. But we will not disappear. "We just integrate and transform into other things. In classical reincarnation you are reborn into another animal but I believe it’s more like an energy, what Buddhists call a transmigration of souls. The idea we connect with everything: with the sunlight, the Earth, the animals – we are all recycled. That’s what I’m interested in." There's also a nice picture of Joei at Out. 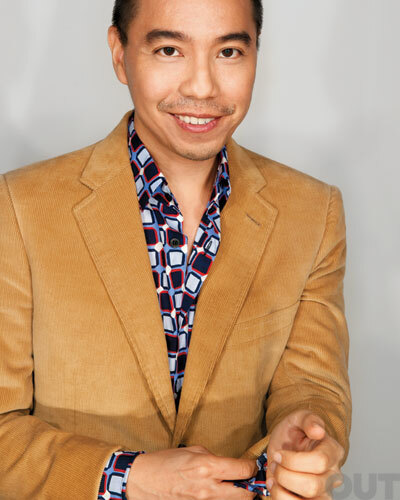 Recent film festival appearances have included opening the Tokyo FILMex, where Apichatpong served on the fest's first-ever competition jury. It also played at the St. Louis International Film Festival, and is in the Tallinn Black Nights Film Festival, alongside Anocha Suwichakornpong's Mundane History. It was in competition at the International Film Festival of India. In fact, the print's being in Goa delayed the screening of Boonmee at the Jakarta International Film Festival, where it's now set for one screening on December 3. 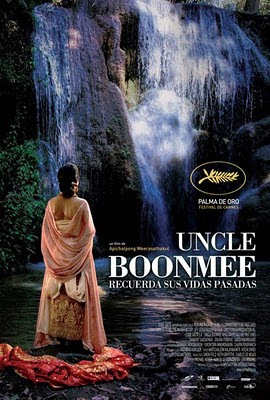 Uncle Boonmee is in Honolulu in the Southeast Asia on Screen series, alongside Who Killed Chea Vichea?, Dear Galileo, Sawasdee Bangkok, Agrarian Utopia, Woman on Fire Looks for Water, Rainbow Troops, In the House of Straw, 15 Malaysia, Talentime, The Forbidden Door and Same Same But Different. And it's opening in Spain, hence the gorgeous poster of the Catfish Princess at the top of this post. Cineasia has an interview.